A deal on every billboard… Offers you can’t refuse on products you don’t need. Ad campaign from a major apparel retailer? Hundreds of thousands of $. The death toll rose again yesterday, April 24 2013, because of greed fed by artificially created demand. 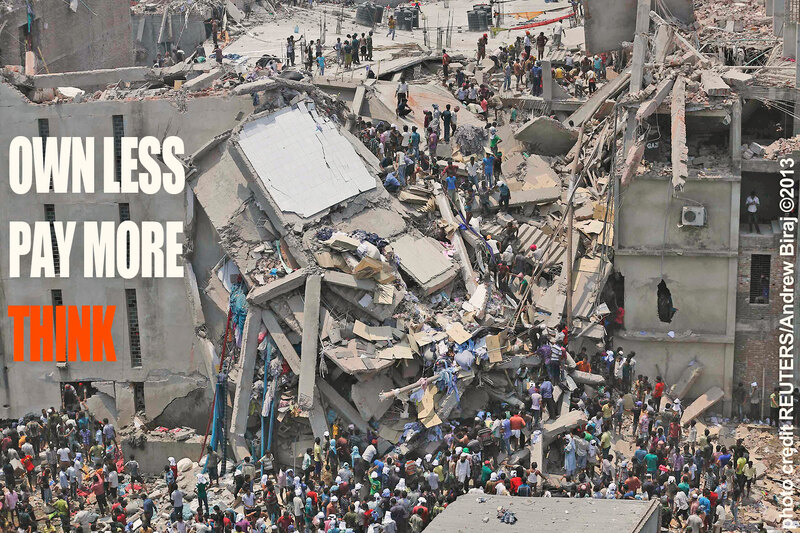 Some 228 260 348 530 801 (and counting) workers perished in a multi factory building collapse in Savar, Bangladesh. Some 19 miles from the previous incident in Dhaka we mentioned back in November 2012, claiming the life of 117 workers (mostly women) in a garment factory deadly fire. Who really picks up your tab on a clothing bargain? Don’t just buy cheap, it’s not worth it, buy right. Clothes cost money for many reasons. One of them is because real People make them. Do your research before you purchase anything. Don’t buy it and they will stop making it. THINK, OWN LESS, PAY MORE.